At the same time, we have retreated from public spaces of our old neighbourhoods into the private spaces of our automobiles, the anonymity of our high-rises, the security of our gated-communities, and the isolation of our urban homes. Because of almost total reliance on the automobile, we find it inconvenient to ship and live in our older neighbourhoods, and we too often use their streets as one-way speedways to get us everywhere else. The false fire-alarms at the Art Gallery of Hamilton- AGH- got us talking and Bill Manson told that he has written four books on the local history of Hamilton, which he says he started exploring a bit more closely since he retired sixteen years ago. His talks on Expanding the Circle: Robert Davidson and the Ancient Language of Haida Art and Sara Angelucci: Piece Work were well researched and informative and give a window into what it means to be a Canadian living in the 21st century, in the year of celebration of Canada’s 150th birthday. By living in an area-one gets associated with many aspects of that region. Or the Maltese Chapels and Museums which came with our association with the Sweiqi-St Julian region of Malta. Walks through the Toronto Zoo, Royal Ontario museum and Port Credit area came with the association with Mississauga. Touching base with the Garhwal Himalayas-when I visited my father’s cousin sister, she took me to the Dhari Devi Temple, where our family has been associated for centuries and many generations. She remembered the time when her children were small- and they used to come for a picnic to Dhari Devi. Now both –Divyanshu and Mitali are studying in Dehradun. Joshi-ji is preparing for his retirement next year, and he told his children to first secure base with one qualification which will earn them some stability and later build on that and buttress one’s academic portfolio. Both children are following that realistic bottomline approach and slowly expanding their Horizons. Our families go back a long way, and many associations over the decades , which add depth and perspective and identity came alive as we spent a quiet evening. The Alaknanda flows nearby. This is where our ancestral village is. 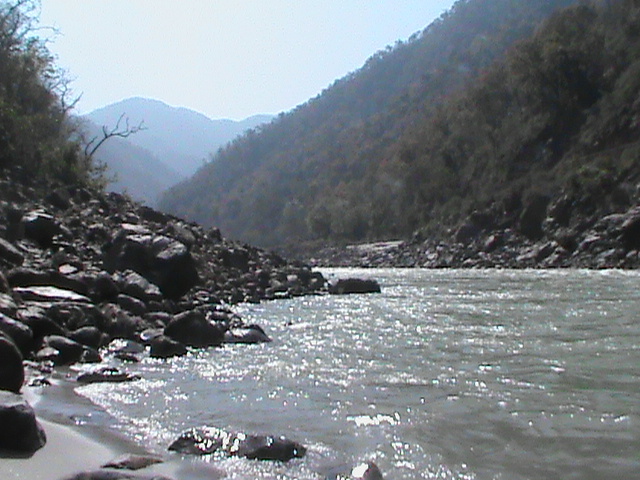 In the Garhwal Himalayas, before the Ganga is formed- at Devprayag. Meditated on the meanings of Satsang, over the years. I went through parts of the books –Footsteps in Time and History of Transportation in Hamilton, with my sons, and we decided to have a relook at some of the Neighbourhoods with whom we have been associated with before coming to Canada in 2012. As many chronic immigrants tell – Five years is regarded as a new immigrant here. It takes a few years to figure out life over here. Because of our association with the Sweiqi- St Julian Neighbourhood of Malta , we were associated with some art movements of Southern Europe and got a feel of European civilization first hand. Living in a place is different from visiting it for a few days. Getting into the system of schools, transport, housing made us explore the layers of community involved in the St.Edward’s college Cottonera, the Museums and Theatres of Malta. As I thought about the words of Bill Manson, a life long educator, who used to teach theatre, about the anonymity of the lives, and the works of artists like Sara Angelucci which give voice to the anonymous worker, her meaning of Alchemy came to mind. This entry was posted in Canada 150 years and tagged Canada, Diary, Indian Diaspora, Malta. Bookmark the permalink.